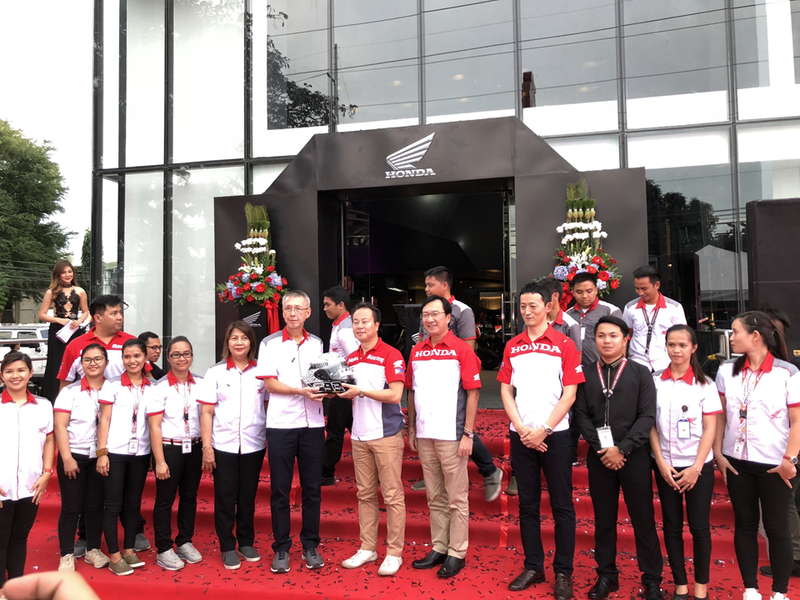 Following the launch of its latest big bike collection in Makati and Cebu, Honda Philippines, Inc. (HPI), the leading motorcycle manufacturer in the Philippines, just unveiled its new Big Bike Showroom in its Flagship Shop in Buhangin, Davao City. The new showroom is expected to excite motorcycle enthusiasts in the region as it highlights a new feature to the flagship store. As a premium hub for Honda’s growing community, this modern-design showroom was built in partnership with DESMARK Corporation, one of the leading motorcycle dealership of Honda. Covering approximately 6,960 square meters, the store features an extensive, multi-rack display of Honda products, a well-appointed riders’ lounge, and a test ride area. These features are intended to showcase Honda’s cutting-edge motorcycles, innovative power products, and genuine spare parts. With the addition of the new Big Bike Showroom, the flagship store now highlights the latest collection of Honda Big Bikes. These new bikes are designed especially for thrill seekers and adventurers who require tough and heavy-duty motorcycles with bigger engine displacements. They are also made to deliver the speed and performance, suited for highway cruising and taking on rough terrains. A total of eight new Honda Big Bike models will be housed in the showroom categorized into four types: Roadster, Sports/Racer, Traveler, and New Adventure. Honda introduced its roadster category, starting with the Rebel 500, which is designed for both laid-back cruising and a more active sports riding. It features a rider’s triangle, as well as its 471cc liquid-cooled, parallel-twin cylinder, four-stroke engine that is tucked in a low chassis with a minimalist design. Also available is the CB650F, a middleweight, naked street-style motorcycle with stylish exhaust pipes that wrap around its four-cylinder, 649cc, DOHC inline engine. It also comes with a new six-speed ratio gearbox, a two-channel ABS, a 41mm SDBV telescopic fork and a fully adjustable Showa suspension for smoother riding. The CB1100EX, on the other hand, has a classic design integrating modern features with its seamless fuel tank, deep chrome exhausts, 17-inch cast aluminum wheels, and a hand-built look. It also has an air-cooled, inline four-cylinder, 6-speed transmission, 1140cc engine, a two-piece front fork, remote reservoir rear shocks, four-piston caliper brakes, floating discs, and a sharper chassis. This model is set to arrive in the Philippine market very soon. Meanwhile, for sports enthusiasts, Honda has the CBR500R, a big bike infused with a next-level, inline-twin 471cc engine with power suited for racing. Designers of the bike fused aggressive styling with its comfortable framework for riding, as well as a traditional bike image and modern, sleek design. This middleweight sports bike has an aerodynamic fairing and air ducts, specially designed all the way to the two-channel ABS and 41mm SDBV telescopic fork. There is also the CBR1000RR FIREBLADE SP, which is designed with the MotoGP racing DNA in mind. It is engineered to have lightness, precision, and controllable handling as evidenced by its Selectable Torque Control and Engine Break Systems, New ABS Brakes, Quickshifter, Riding Mode Select System, Power Selector, and an ӦHLINS Smart EC Suspension. This model is set to be available in the Philippine market very soon, along with theCB1100EX. Honda’s Traveler Big Bikes include the CB500X, a mid-displacement bike, designed for all-around use. It is also suited for taking on any type of terrain. This bike also features a liquid-cooled, 471cc, parallel-twin engine, suited for both short and long-distance rides, while still being fuel efficient. Honda also unveiled the CRF1000L Africa Twin. It has a 998cc liquid-cooled, four-stroke, parallel-twin engine and has the exclusive Honda Selective Torque Control for efficient power delivery on a wide range of road conditions. It is also perfect for adventure riding that requires natural and athletic movements, especially since it is built with Biaxial Counterbalance for strength and handling to deliver a smooth and vibration-free ride. Finally, Honda introduced its New Adventure Category of Big Scooter (Automatic) with the X-ADV featuring a unique crossover platform. It is built around a strong, tubular-steel chassis and has a 745cc twin-cylinder engine and Dual Clutch Transmission (DCT) for firm handling on different road surfaces and conditions. To handle dirt roads, Honda X-ADV is also built with a 41mm upside-down fork, a preload-adjustable Pro-Link rear shock, and a ground clearance of 162mm. It is equipped with a five-way adjustable screen, tapered aluminum handlebar, Africa Twin hand guards, Rally-style instrument display, and center stand. These Honda Big Bikes are now available in HPI’s Flagship Shops in Davao, Cebu, and Makati, except for theCB1100EX and CBR1000RR FIREBLADE SP, which are set to excite Filipino motorcycle geeks this 2018. The Big Bike Showroom is open to Honda’s community of riders in Davao. The shop is located at Km. 5, Buhangin Road, Davao City and is open from Monday to Saturday from 8:30 A.M. to 5:30 P.M.
For more information on Honda Big Bikes and Flagship Shops, visit www.hondaph.com or like Honda’s official Facebook page at Facebook.com/HondaPH.